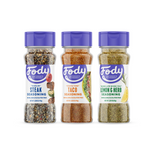 EnglishFrançais Low FODMAP Garlic Infused Olive Oil | Fody Food Co.
Bring back the flavor of garlic to your food, the Low FODMAP way. This powerfully delicious Low FODMAP garlic infused olive oil is made in Italy with the finest extra virgin olive oil. It is the first of its kind to be tested and certified Low FODMAP by Monash University. Every drop packs a lot of flavor! Use this Low FODMAP garlic infused olive oil in sauces, fried with veggies and meat, or drizzled on roasted potatoes. The possibilities are endless! Hurry, there are only 376 item(s) left!